Emes Ve-Emunah: Rabbi Sherman Must Go! Why do I care what Rabbi Avarham Sherman says? Personally I don’t. I don’t really have much respect for people that cause the kind of damage he does. But the damage is real. He is a man of considerable influence in the Israeli Orthodox rabbinate. He cannot be ignored. His public comments must be addressed. Which should be in the form of a complete rejection of recent comments about two Modern Orthodox rabbis. He has labeled both Rabbi Haskel Lookstein and Rabbi Avi Weiss Kofrim (heretics)! And adds that all of the people that they have ever converted are not Jews and need to go through the conversion process again. 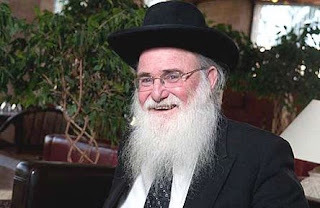 Back in 2008 a controversy concerning the conversion of Russian immigrants of questionable Jewish lineage arose, A special conversion Beis Din was set up and headed by Rabbi Chaim Druckman - who at the time was a respected Religious Zionist Rosh Yeshiva. There are a great many Russian immigrants like that. Many Russians came here thinking they were Jews – having a Jewish father and non Jewish mother; or a mother with an improper conversion. They need to convert to be considered Jewish. Rabbi Druckman was asked by the government to quickly convert this mass of Russians by using any Halachic leniency he could find. One can debate whether the leniencies he used were acceptable. But one cannot question his integrity. And yet Rabbi Sherman who was the Chief Judge of the rabbinate at the time did just that. Not only invalidating Rabbi Druckman’s Russians converts but every single individual he ever converted! This surely caused tremendous anguish not only to the Russians but to all of his previous converts. And it caused anguish to Rabbi Druckman. I recall Rav Aaron Lichtenstein, ZTL being outraged by it. One may argue that Rabbi Sherman was just being true to his ideals in rejecting those converts since he felt that the means used were not Halachicly valid. Perhaps. But certainly the conversions prior to these Russians were valid. Furthermore he can’t really say that about Rabbis Lookstein and Weiss. Can he honestly say he knows that the means used by these rabbis were invalid? I don't think so. But he did offer a reason for rejecting their conversions. He called them heretics. Once you are a heretic you cannot possibly convert anyone no matter how legitimate was the procedure. How can he call Rabbi Lookstein and Weiss heretics? What does he really know about their theological views? He claims that Rabbi Lookstein issued Halachic decisions that contradict the Shulchan Aruch. Well, one can disagree with Rabbi Lookstein’s Halachic decisions. But that does not make him a heretic. Does Rabbi Sherman really believe that Rabbi Lookstein purposely perverted Halacha? I cannot help but believe that this is all about rejecting Modern Orthodxy in all its incarnations. Perhaps he doesn't think one of Rabbi Lookstein’s more famous converts, Ivanka Trump Kushner, was sincere enough in her acceptance of the Mitzvos because of the way she dresses. I wonder, though, how many investigations he’s done on his own converts in this regard? My guess is - not many. Certainly not all. Using his yardstick - maybe all of his own conversions should be questioned. Rabbi Sherman seems to be a maverick in the Israeli rabbinate. Rabbi Lookstein is a vice president of the RCA Beis Din which supervises conversions. RCA conversions have been accepted by the Israeli rabbinate for some time now. That he does not accept Rabbi Lookstein’s converts is indicative that he is a maverick. Rabbi Sherman may think by rejecting rabbis whose Hashkafos he doesn’t like – he keeps the chain of Jewish lineage pure. But in my view what he is really doing is oppressing the convert - just because he doesn't like those that are Modern Orthodox. If he is still a member of the Israeli rabbinate, he ought to be asked to resign. And he ought to never again be seen as any kind of authority on this matter. Nor on any other religious matter.